(Hotel atrium, mood lighting, tall round tables to encourage gathering in small groups. Wine.) Writer joins on-going conversation, only to discover that it is about The Greatest Book Ever. Writer has always meant to read TGBE but has not, mainly because Writer secretly thinks that TGBE actually sounds boring/pretentious/confusing/overrated. Now Writer is faced with a choice: come clean about (still!) not having read TGBE and risk facing a number of astounded and/or disapproving looks; bluff, based on what Writer remembers from that NPR review eight months ago; or spill wine on own shoes and hurry off to the restroom. If you’ve never been in this situation, congratulations! 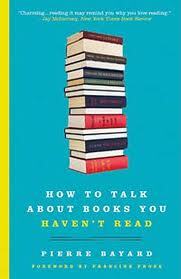 Either you read everything, or you avoid any and all potential book-related conversations. I have been in that situation (as evidenced by my shoes) and so I was intrigued when I came across this month’s Last Monday Book: How To Talk About Books You Haven’t Read, by Pierre Bayard. That’s comforting for all of us who have teetering to-be-read stacks, and this is a quirky, original book that is by turns literate and irreverent. But I’m not sure I agree with all the author’s points. I appreciate the permission to not feel self-conscious about books I haven’t read, but I think I’d rather talk about the ones I have read with other people who have done the same. Are you comfortable talking about books you haven’t read? I generally just say ..."Haven't gotten to that one yet." And if I'm feeling really honest and have no interest in the book, I might actually come out and say, "That's not a genre I enjoy" or "The premise didn't win me over. I have other things I want to read." Unless, of course, the author is physically present, and then I smile and say, "It's on my TBR pile!" I do the same thing Dianne does. Speaking of teetering stacks of books I haven't read yet...now I've taken to loading my Kindle to help reduce clutter. I have another 30 books there I haven't read. Nice description of the atrium during the cocktail hour. I'm looking forward to it.